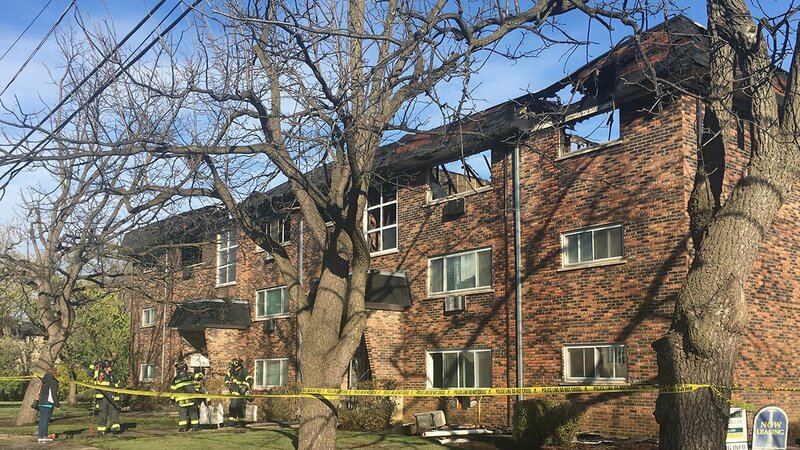 BENSENVILLE, Ill. (WLS) -- A man who died in a fire that consumed the top floor of an apartment complex in west suburban Bensenville was identified Monday by the DuPage County Coroner's Office. Steven M. Nelson, 64, of the 300-block of Marshall Road, was killed Sunday after flames ripped through his apartment building. Bensenville police and firefighters responded just after 6:15 a.m. to a report of a fire in apartment 9A, where Nelson lived. The fire spread from his apartment to the third floor of the adjacent building. Twenty-six fire departments were called to help fight the blaze, authorities said. Crews found his body around 9:55 a.m. After the coroner arrived at the scene around 12:30 p.m., Nelson was pronounced dead. The DuPage County Arson Task Force, coroner's office, and police and fire departments are investigating the deadly fire. All of the 18-unit building's residents, about 35 people, were displaced by the fire. The American Red Cross helped them find a place to stay. Ted Gehman, who lived in the building with his girlfriend and dog, said they were the last to evacuate. The fire had been burning for nearly an hour before firefighters woke them up. "I woke up to firefighters banging on our door," Gehman said. "We grabbed our pups and ran out with jeans in one hand and a dog in the other." Gena Lovergine, who lived on the top floor with her fiance and daughter, lost nearly everything in the fire - except for her engagement ring, which was recovered by one of the firefighters. "It was given to me, the diamond was given to me by my mom," Lovergine said. "My dad gave it to her. My dad passed away when I was 8. This is all I have left of him. Everything else I had that was in there that was his is gone." While the material losses are painful, Lovergine said it is not what matters. "All three of us are safe. We all have our lives. That is the one thing that can't be replaced. All of that is money," she said.